A PDF might be a more convenient reading format than a big, tall JPEG. Shhh! Grab it before IT yells at me for posting a 6MB blob. 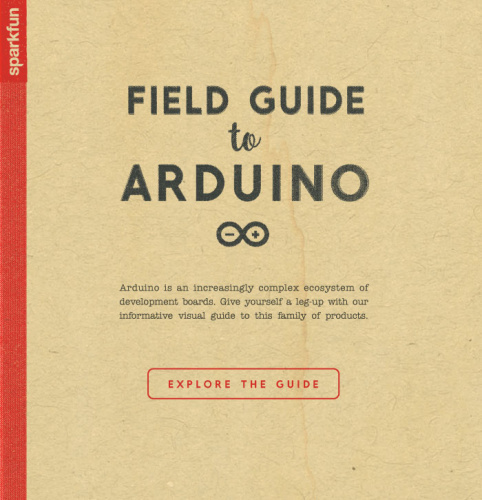 I would like very much to have a downloadable PDF of your booklet Field Guide to Arduino. It must be printer friendly. Thanks for the PDF, But would make a version that was easy to print. Curious why the Teensie's weren't included. Wait, an ATMega168 is more powerful than an Amiga 4000? Sacrilege! I demand a recount! Yea, that comparison chart isn't even wrong. It is so obviously fraudulent that they probably should update that part of it. Any AVR would be totally smoked by a 286 and demolished by a MC68000 series chip beyond a couple of carefully staged tests where the AVR has advantages like hardware multiply and DES/AES support. 640KB of ram might not be enough for anyone but it certainly beats the pants off of 8K, which is the most any AVR has in it. Even when you add in the flash, the most a normal AT MEGA can have is 512KB and you are doing PC style segmentation as soon as you go beyond 64K and it really gets annoying beyond 128K. Where the AVR wins is both performance per dollar and watt. Those are plenty good enough reasons to use it, no need to embellish the truth. We understand that MIPS is not a measurement of computing "power" and that the richness of the instruction set, branching, etc. play a key role in determining the speed and performance of a CPU. That being said, MIPS is still a really good measure of task performance speed and we don't feel that it's disingenuous to compare the 168 to legacy hardware on those grounds. Sorry if it bummed you out, frankly, I think it's a pretty cool comparison. No one here is trying to say that an ATmega would be better than any of those computers at their given application. I figured that you might be only looking a MIPS. I don't remember what the clock speed was on the old VAX11-780 was, but it was considered a supermini computer at the time. With the ability to address megabytes of 32 bit wide memory comparing it to an ATmega328 is a bit lame. The atmega might be able to sprint by the VAX in a few well placed subroutines, but it would lose the race in total work done. OTOH a $35 RPI might give the old VAX some cause for embarrassment, especially if you hooked up a "small" disk drive to it via a USB-SATA adapter! BTW, the month of February has about 2.5 million seconds. In February, 1983, I used a bit over 1.5 million CPU seconds on a VAX 11/780. I love it. Long live the long since dead Arduin!! !